Joel Hass received his PhD from the University of California-Berkeley. He is currently a professor of mathematics at the University of California-Davis. He has coauthored six widely used calculus texts as well as two calculus study guides. He is currently on the editorial board of Geometriae Dedicata and Media-Enhanced Mathematics. He has been a member of the Institute for Advanced Study at Princeton University and of the Mathematical Sciences Research Institute, and he was a Sloan Research Fellow. Hass's current areas of research include the geometry of proteins, three dimensional manifolds, applied math, and computational complexity. In his free time, Hass enjoys kayaking. Maurice D. Weir holds a DA and MS from Carnegie-Mellon University and received his BS at Whitman College. He is a Professor Emeritus of the Department of Applied Mathematics at the Naval Postgraduate School in Monterey, California. Weir enjoys teaching Mathematical Modeling and Differential Equations. His current areas of research include modeling and simulation as well as mathematics education. Weir has been awarded the Outstanding Civilian Service Medal, the Superior Civilian Service Award, and the Schieffelin Award for Excellence in Teaching. He has coauthored eight books, including the University Calculus series and the twelfth edition of Thomas' Calculus. George B. Thomas, Jr. (late) of the Massachusetts Institute of Technology, was a professor of mathematics for thirty-eight years; he served as the executive officer of the department for ten years and as graduate registration officer for five years. Thomas held a spot on the board of governors of the Mathematical Association of America and on the executive committee of the mathematics division of the American Society for Engineering Education. His book, Calculus and Analytic Geometry, was first published in 1951 and has since gone through multiple revisions. 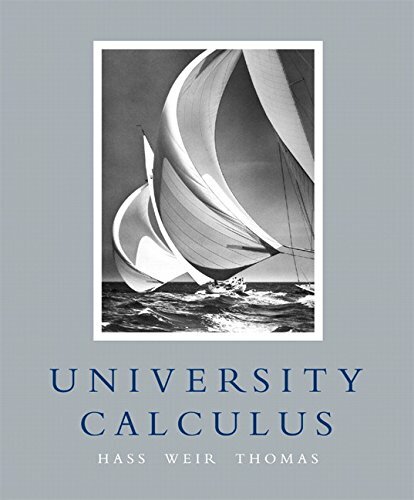 The text is now in its twelfth edition and continues to guide students through their calculus courses. He also co-authored monographs on mathematics, including the text Probability and Statistics. Hass, Joel R.; Weir, Maurice D.; Thomas Jr., George B.
Joel R. Hass; Maurice D. Weir; George B. Thomas Jr.